He was born on the 27th of June, 1973 in Migachevir city. He finished Mingachevir secondary school # 10 (present 15) in 1990. Though he entered university in Vitebsk city, he came back to Mingachevir instead of continuing his education. And later obtained a job at the Factory of Technical Rubber product in Mingachevir where his father was also working. Ruslan was very much troubled about the undeclared war and everyday he was following all the news about new events on the television. The fact, that his compatriots were banished from their own historical lands, the disgusting lies of the enemy and the injustice that was ruling over the country worried him very much. He was impatiently waiting for time where he was going to be called for military service. Finally, he started serving with the Internal Troops on the 22nd of January, 1992. After several months’ military training, Ruslan was sent Papravand village of Aghdam region on the 14th of April, 1994. The bloody battle would not stop for the sake of abandoned village. The battalion where Ruslan was serving had several successful operations. The civilians returned to their homes. As a very diligent scout, Ruslan had his significant role in this successful operation as well. His precise and accurate information about the enemy was of crucial importance. In August, 1992, the plane that belonged to Azerbaijani Armed Forces was shot within the enemy territory. Muradov along with several other soldiers was also taking part in the operation to rescue the pilot. But they were ambush during the operation and surrounded by the enemy. After two days of hard struggle and severe battle, they finally managed to break the siege. Muradov Ruslan died heroically in the battles for the sake of Gulyatag village of Aghdam region on the 22nd of August, 1992. 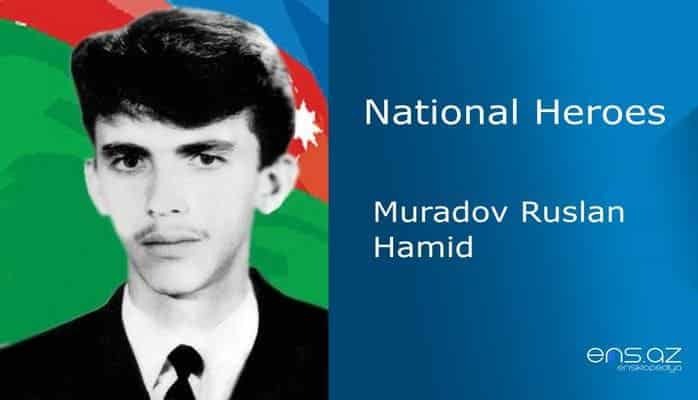 Muradov Ruslan Hamid was posthumously awarded the title of the “National Hero of Azerbaijan” by the decree # 290 of the president of Azerbaijani republic on the 6th of November, 1992. He was buried in the Alley of Martyrs in Mingachevir city. The secondary school where he once studied is name after the hero and there is also a monument of him in the school.